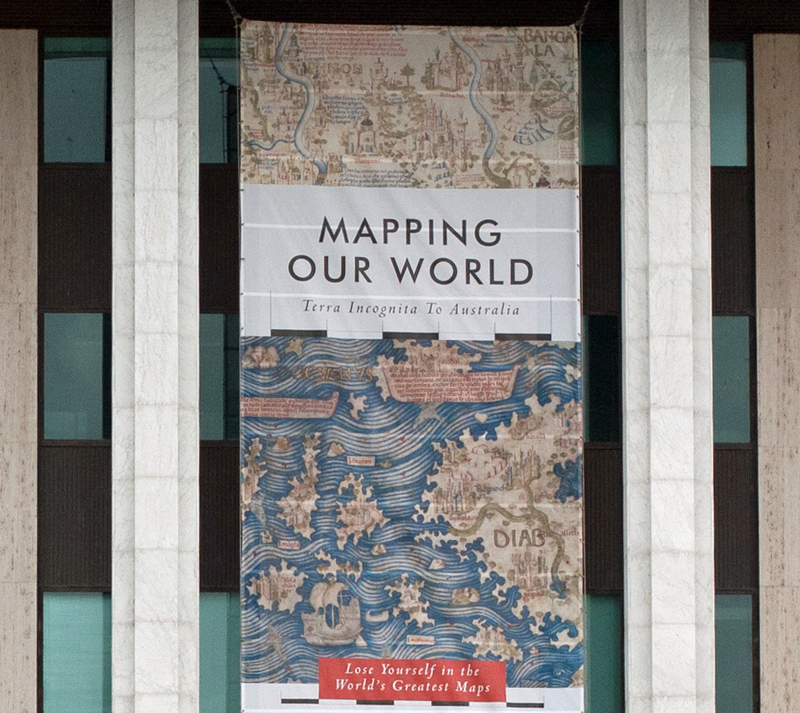 It was timely that the National Library’s latest exhibition, Mapping Our World, opened just before I head out on a No Sat Nav drive. I registered for a guided tour as soon as the phone lines opened so that I could lose myself in the world’s greatest maps. Although, as it turns out, in such small rooms one tends to lose oneself in the crowd instead. Maps turn up in many of my posts because exploring is the overarching theme of my blog. I recommend “I believe in exploring” as a great place start, even though the ending is a little corny. Or if you don’t mind the slightly bizarre, perhaps “Maps and Auto Focus”, where I try to link ideas about navigation and direction with learning how to use my digital camera. And finally, a useful suggestion in “Travelling with Camera in Tow” – return from your travels with photographs of the maps you used along the way. Maps are the product of a curiosity that is not kept secret. Even maps that are hidden for a time, in order to keep an enemy or competitor at bay, are eventually brought into the public domain. Perhaps it is this sharing of knowledge, this passion for place, that so appeals to me. An exhibition like this will certainly appeal to history buffs and artists. But I’m also recommending it for anybody and everybody. Take some time to look at something that is so completely unusual in this day and age; just let your mind absorb and ponder. Creativity is born from these unexpected and unusual encounters. I recommend picking a time of day when the number of visitors is smallest. The tour guide was top notch. He talked about the known and the imagined. He talked about the speculative. And the gradual refinement that removed the monsters from the borders when scientific enlightenment took hold. The room of “uncharted” charts grabbed my attention. Here were our ancestors drawing maps of places they had never been, never seen, and couldn’t even measure. It reminded me of many conversations where speculation is opinion and opinion is fact. As I get older, I am determined to see more question marks. The Mapping Our World catalogue is worth every penny but it wasn’t until I opened it that I realised the exhibition is sponsored by Shell (that petroleum company). It shouldn’t be surprising as it’s a perfect match. Trade and commerce are still the driving force behind much of the world’s exploration … and exploitation. As a species, we have a drive for information, for knowledge. We need to fill in the blanks and remove the monsters from the borders. I wonder what the world would be like if we had financed that drive for knowledge in some other way?